Herban Planet, LLC Oct 13, 2017 The blacklight poster is a unique art form that found popularity with the cannabis community in the 1960s and 1970s. Blacklight art has an interesting history and is experiencing an exciting resurgence today. The blacklight poster might not be revered like Post-Impressionism or Baroque, but is a true art form of its own, created using fluorescent ink. And no tried and true stoner can say they’ve never attended a smoke session where there was a blacklight poster or two hanging on the wall. To create black light art, a poster is printed with ink that responds when hit with UV light. Though they can be seen in regular light, they do not glow. The ink gives the work a surreal, trippy appearance when shone under a blacklight. In early 18th-century ultraviolet light and infrared lights were discovered by Johann Ritter and William Herschel respectively. Then, in the 19th-century fluorescent paints were invented by two brothers Bob and Joseph Switzer. They combined fluorescing minerals and compounds to make a kind of pigment which is used in blacklight art. Black light posters first became popular in the 1970s, largely out of San Francisco, California, and continue to be popular to this day. Fluorescent products began to be used in common decorations in the late 20th-century. Black light posters were popularized due to glowing concert posters for bands like Grateful Dead. The psychedelic designs fascinated young people. Psychedelic posters also gained popularity for depicting Hindu deities and Buddha to people who love the glowing warmth of the images. 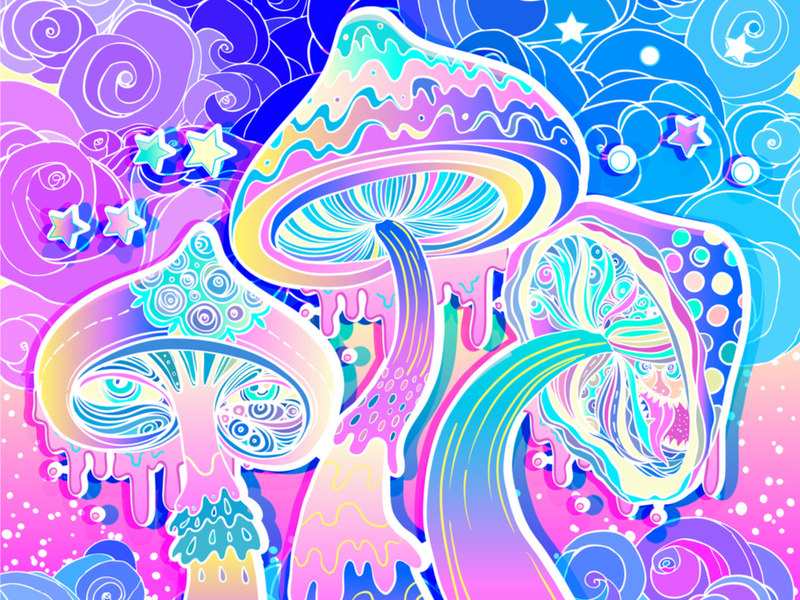 It’s easy to understand why blacklight art became a part of hippie culture. Famous and not-so-famous artists used blacklight ink to depict the culture (which included a lot of marijuana references). Blacklight art has also been known for its depictions of famous musicians and pop culture icons (Jimi Hendrix, Led Zeppelin, and, of course, Bob Marley, to name a few) and at times, its playful sexual imagery. Cannabis has been consumed for over 4,000 years in every ancient civilization, for example: ancient India, Romania, Egypt, and Mesopotamia. It was regularly utilized as medication, and the most common means of ingestion was, and remains to this day, smoking. As cannabis was an integral part of the 1960s and 1970s hippie culture, the time when blacklight art was becoming popular, it’s only natural that cannabis found its way into a lot of blacklight art and blacklight posters started appearing in every stoner’s basement or smoke room. Blacklight art has experienced a significant resurgence in recent years, and this time it has become more mainstream. This may be due to the popularity of Color Runs, glow-in-the-dark-paint parties, and even colorful bath bombs. While having a blacklight poster hanging in your living room used to denote, “pothead,” it no longer does. Blacklight posters may not be for everyone, but they found an early popularity with the 420-community and continue to today. Blacklight as a medium has evolved for hundreds of years, even though it has only been widely known for the past 50+, and will continue to do so. For example, you can now purchase textured and 3-D blacklight art! Who knows what the future will hold?